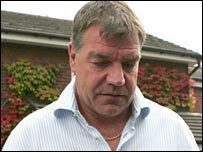 Bolton manager Sam Allardyce has denied all allegations of corruption levelled at him during a BBC Panorama programme. The film shows two agents claiming they paid bungs - illegal payments - to Allardyce, who has asked his lawyers to take "appropriate" steps. "Obviously I'm denying all allegations that have been alleged against me. The matter's in the lawyers' hands and will be resolved by due process," he said. "I have instructed my lawyers to take the appropriate action." Allardyce insisted he had been the innocent victim of the "greed" of others on the programme. The Bolton boss admitted: "As a father, of course, it is painful to watch your son talk tall and exaggerate his influence for financial gain. The FA has asked for any evidence uncovered by the Panorama programme. "These are serious allegations which have been made by Panorama and we are determined to investigate them fully," said FA chief executive Brian Barwick. "It is vital for the integrity of the game and for every football supporter that we do this." And Bolton Wanderers Football Club has also said it may request further information from the BBC. A Bolton statement said: "The club takes the allegations broadcast very seriously but owes it to its fans, Sam and all of its players and staff not to over-react. "It is our duty to act only on facts and hard evidence. The club is committed to conducting a thorough and robust investigation into the allegations which were made in the Panorama programme. "As part of the process, the club will work with Sam to establish the facts." BBC Panorama has said in a statement that it will cooperate with requests relating to the programme from the relevant investigating authorities, and "will do so in line with our normal processes and procedures in cases of this kind." Former England managerial candidate Allardyce also told the BBC he would not condone any breaches of FA rules.